Free-roaming/Feral cats are neither mean nor vicious, but they are scared. They are similar to wild animals, in that they are undomesticated and can cause serious injury. Keep children and pets away from traps. Never stick your fingers into a trap. Once a cat is trapped, wear heavy gloves when opening a trap to slip in food or water, or for any other reason. Open the trap only far enough to slip in the dish. Never try to grab a free-roaming cat if it’s escaping. The cat may lunge, bite and/or scratch to get away. A bite or scratch should be taken seriously. Seek medical attention immediately. Picture of the Tomahawk traps that we loan and use. feeding. Most cats (if hungry) enter a trap the first day it arrives. Stop feeding the cats the day before trapping so they become hungry. Inform other people who also feed the cats so that they do not jeopardize your chances of success. Prior to trapping prepare an area to hold the cats before and after surgery. A garage or other sheltered warm, protected area is vital. Spread newspapers on the floor to catch feces, urine and food residue. Elevate the traps on pieces of wood or bricks, allowing waste to fall through the wire and away from the cats. Prepare a vehicle for transport by laying down thick plastic (such as paint dropcloth found in the hardware section) to protect the carpet and upholstery. If possible, set the traps just before or at the cats’ normal feeding time. Use caution and common sense – do not trap in the rain or heat of the day without adequate protection for the trap. Place the traps on a level surface in the area where the cat usually feeds, making sure it is on a level surface. If it is wobbly the cat is less likely to enter the trap. Fold one sheet of newspaper to line the bottom of the trap, just covering the trip plate. Cats don’t the feel of the wire surface. Be sure the paper clears the bar on which the trap door closes and that the paper does not extend beyond the trip plate. Too much newspaper can interfere with the trap mechanism or prevent the door from closing properly; a single piece works well when folded. scrap of newspaper, then place the trap over the food. from outside the trap. Make the food difficult to reach so that the cat must enter the trap completely, as far as possible. Never leave traps unattended in an unprotected area, but don’t hang around within sight of the cats. 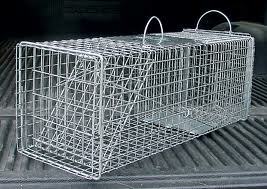 (A trapped animal is vulnerable and could get injured inside a trap. Passersbys may release the cat or steal the trap.) Wait quietly in an area where you can see the traps without disturbing the cats. Preferably within a vehicle or behind a building. When the trap is sprung it can usually be heard. As soon as the intended cat is trapped, remain quiet, cover the trap completely and remove it from the area. Always use the handle and wear heavy gloves. If you are trapping multiple cats, consider putting another trap in the same spot. If trapping a lactating female (one that is producing milk for kittens), you may want to wait until you have located the kittens and know they are old enough to wean (4 to 6 weeks.) If you catch younger kittens, you will need to feed them an appropriate kitten milk replacement product until they are weaned. A mother will usually bring her kittens within view as weaning approaches. Mothers will be attracted by the sounds of their kittens if the previously captured kittens are placed in a covered carrier just behind the trap. Place the door of the carrier facing the rear of the covered trap. Similarly, kittens will be easier to trap if a captured mother is placed in a carrier behind the trap. Never place the “bait” animal in the trap, or where it may be hurt by another animal. If the trapped cats have to be held, place them in your prepared protected area and keep the trap covered. Cats feel much less threatened when covered. Cats should not eat within 12 hours prior to surgery. Water can be available up to the time of surgery and is necessary if the cat is held in the trap for more than 8 hours after capture. Typically cats should be held for 24 hours after surgery before releasing them. Cats can receive a small amount of food and water while in their traps a couple hours post recovery if they appear alert enough to eat and drink. When cats are ready for release, if possible return them to the area in which they were captured. Unless absolutely necessary, do not relocate the animal. Cats could become disoriented and die, get killed while trying to find their way back to their home or be driven away. frantic, remove the covering and allow it to observe the surroundings for a few minutes before release. Plan the release according to the weather, time of day, traffic flow, kids getting out of school, etc. Use extreme caution and wear heavy gloves. Stand in the opposite direction of where you want the cat to go, and let the cat observe where you are before releasing it. It will run away from you, so face it in the direction of its home. When ready, place the trap with the door facing away from you and open the door. If your trap has a back door opposite the trap door, release is easier. Most likely the cat will bolt immediately out of the trap. If the cat is confused, tilt the trap so the back is slightly elevated and tap on the back of the trap. If the cat still will not leave, prop the door open with a stick or rock without blocking the entrance and leave for awhile. DO NOT ATTEMPT TO REMOVE THE CAT FROM THE TRAP WITH YOUR HANDS. THEY ARE SCARED AND WILL BITE. Hose off the empty traps and disinfect them with a solution of 1 part bleach to 30 parts water. Allow the solution to dry, then rinse it off very well. Bleach residue is harmful to cats. Never store traps in the set (door open) position because animals may wander into unbaited traps. Keep all cats covered and warm throughout all stages of transport, before and after surgery. Do not transport cats in open bed vehicles. Cats have been lost out of unsecured traps on the highway. Check-in is between 5:30-6:30 pm on the Saturday night before surgery. Please wait outside of the clinic in your vehicle until the person in front of you leaves. This will cut down on congestion and confusion during the check-in process. It will also help expedite the process. Upon entering the clinic you will be asked for the number of cats that you trapped and the trap number which is on a metal plate on top of each trap and a drscription of the cat in that trap. All surgeries are on Sundays. Surgery and Pick-up time is on Sunday. You will be given a call when your cat(s) comes out of recovery. This could be as early as noon. You will be provided with a copy of Discharge Instructions. Please review them carefully. They contain important information for the post-surgery care of your cats.